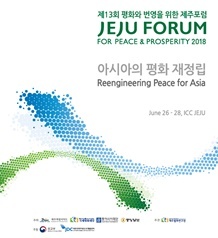 This is a brochure for the Jeju Forum 2018 as of May 11. 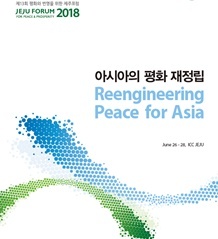 This annual event brochure contains various themes of the sessions and key participants to the Jeju Forum 2018. This book covers brief explanation on sessions and main participants to the forum in 2018. Around 40 partners joined this year's forum and created 70 sessions. To learn more, take a look at our program book. 제13회 제주포럼 행사 개최 결과보고서입니다. 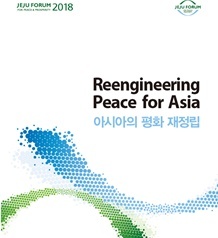 2018년 6월 26일(화)~28일(목) 제주국제컨벤션센터에서 개최된 제13회 평화와 번영을 위한 제주포럼 세션 결과자료집입니다. 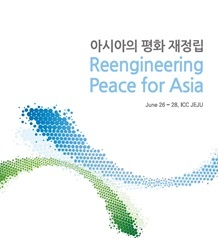 Jeju Forum for Peace and Prosperity 2018 was held from June 26 to 28 under the theme of Reengineering Peace for Asia.